Are we willing to pay the price to multiply? 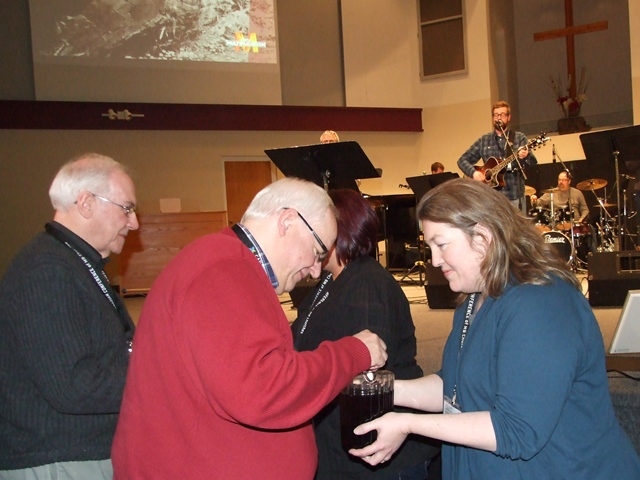 “I didn’t expect to meet God at [an annual general] meeting,” said worship leader Matt Unruh at the 84th annual convention of the Ontario Conference of MB Churches (ONMB), Feb. 2o–21, 2015. Some 130 people worshipped and listened to inspiring stories at Waterloo Mennonite Brethren (Ont.) ChurchFriday night. Guests and partners joined the 95 delegates from 21 of 27 member churches in the Ontario conference who returned Saturday to make decisions. Reimer referred to the Apostle Paul’s flexibility as he found common ground with anyone and everyone in order to save as many as possible (1 Corinthians 10:32–33). In conversation, MB church planter Jon Osmond, community chaplain and planting pastor with FreeChurch in the Annex area of Toronto, agreed with the characterization of Ontario’s shift away from Christianity. In a previous plant 10 years ago, said Osmond, it was much easier to get neighbours to attend church. These days, he and his wife Claudia practice hospitality with wealthy neighbours who are hungry for community but who have no obvious need for God. Similarly, Albanian-born Endrit Mullisi has adjusted his evangelism style to be more subtle as he reaches Albanians in Toronto who have no interest in religion. He celebrates baby steps toward Christ as neighbours experiment with praying in Jesus’ name, though they are not ready to call him Lord. On the convention theme of Costly Multiplication, Robb and Sarah Williamson-Bynoe shared their journey from a dream home in Bowmanville, Ont., to loving people in poverty by living among them. With help fromMoveIn, a ministry associated with the Ontario conference, they relocated to a low income Oshawa neighbourhood with their two kids. “It doesn’t matter how well you are doing in a race if you are running the wrong race,” says Robb. Several speakers and ministry leaders talked about prayer, the moving of the Spirit, unprecedented collaboration among evangelical denominations, and that God is up to something in Canada. 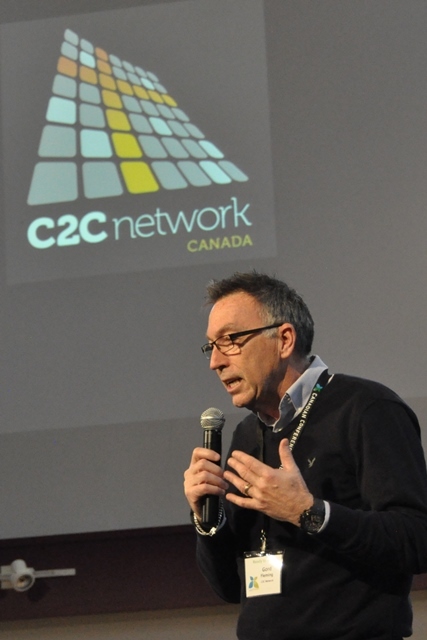 When Gord Fleming, national director of the C2C Network, faced a $ 1.2 million shortfall six weeks prior to the MB-based church planting organization’s fiscal year-end, he called his staff to fast and pray for 30 days. They ended the year with a $10,000 surplus. The frequent rallying cry, “we’re better together” resonated with delegate Steve Spenler from Waterloo MB. Spenler says the Ontario conference is valuable because churches collaborate on ministries like Camp Crossroads. He and his family have benefitted from this “spiritually transformative space” over the years. Willms and the board have fostered increased cooperation on many levels. Not only is there renewed unity between the national and provincial MB conferences, regional leadership clusters of Ontario MB pastors have been formed to reduce isolation and accelerate learning. 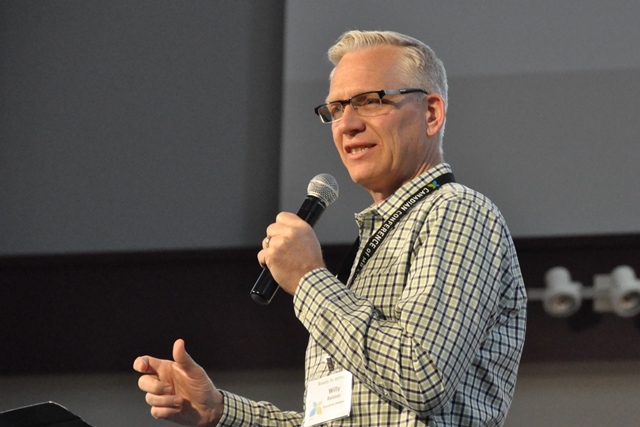 As well, Willms collaborates closely with a senior leadership team comprised of Ed Heinrichs (Camp Crossroads executive director), Philip Serez (MB Mission Eastern Canadamobilizer), and Greg Laing (C2C Network regional director). 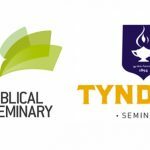 For the first time, the event was livestreamed through the Canadian conference’s Global Mission Media TV(GMMiTV) website, offering remote access to the event for those far away. In the main sessions, there was little discussion and few questions. The meaty business session – with the most voting – took place in the afternoon. Skipping the final coffee break to get people out faster made sustaining attention difficult. In its final budget year, ONMB’s ministry development fund gave $50,000 to 14 Ontario churches to train leaders and develop ministries. Long-time bookkeeper, Vic Boese, was thanked in absentia for his service. ONMB administrative assistant Andrea Kaine will take over as he retires. 21 out of 27 member churches donated to ONMB, but revenue was below budget; mostly due to a shortfall in church and individual giving. 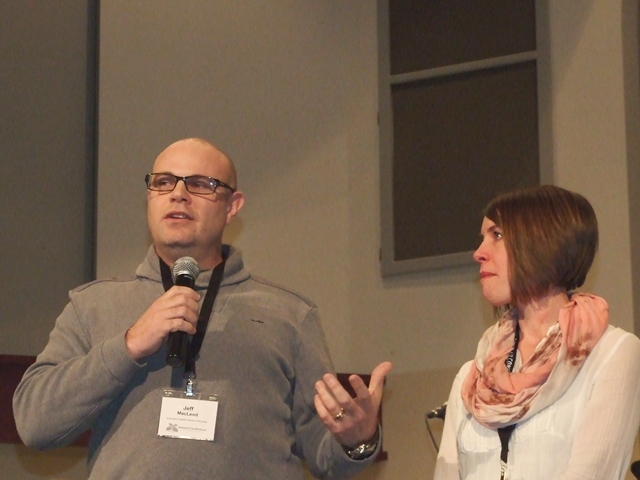 Church plant campuses Annex of FreeChurch Toronto (pastor Jon Osmond) and the Manotick Parish of The Journey, Ottawa, (pastor Darren Milley) were launched. Camp Crossroad’s first men’s retreat was a huge success. 878 youth attended summer camp; 286 campers made significant spiritual decisions. Crossroads also hosted a Christmas dinner for their local community in Torrance. Tabor Manor, owned and operated by ONMB, repurposed their old long-term care home into semi-independent “wellness suites” with supportive services, similar to their sister home for seniors, Pleasant Manor; both are in St. Catharines. Nov. 1, 2014, some 130 people celebrated the 10th anniversary of ONMB-owned and operated Valleyview Manor in St. Jacobs. 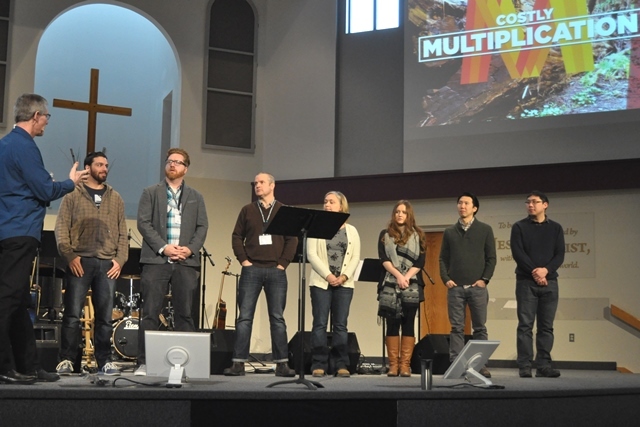 In 2014, Ontario MB churches sent four new long-term missionaries with MB Mission. In 2015, MB Mission will host an intercessors retreat in Ontario and relaunch SOAR (now ESSOR) Montreal, a summer short-term mission program in collaboration with the Quebec MB conference and the Christian and Missionary Alliance. An area parent complained to the Ontario Human Rights Tribunal about District School Board of Niagara’s “preference for Protestant Christianity,” citing in particular the Christian Spiritual Life Centre (supported by ONMB) at Eden High School, a public institution in St. Catharines with 843 students. Breaking news announced at convention was that the case was dismissed. In recognition of the growth of both organizations, ONMB and Bethesda Community Services (ministry serving individuals with special needs), are clarifying their partnership. Delegates approved a 2015 budget of $292,500. Tabitha VandenEnden (Grantham, St. Catharines), Bill Stubbs (Glencairn, Kitchener), Darren Milley (The Journey, Ottawa), and Ron Willms (Southridge, St. Catharines) were acclaimed to the nominating committee. Greg Allen (Meadow Brook Church, Leamington), Shelley Campagnola (Waterloo MB), Jeff Jantzi (The Gathering, Ottawa) and Kim Knight (Waterloo MB) were acclaimed to the leadership board. A temporary amendment was made for the year 2015 to reduce the number of board members from 11 to 10. For those who weren’t at the convention, it’s not too late to be part of what God is doing through the Ontario Conference of MB Churches and their many partners in the province and nation. 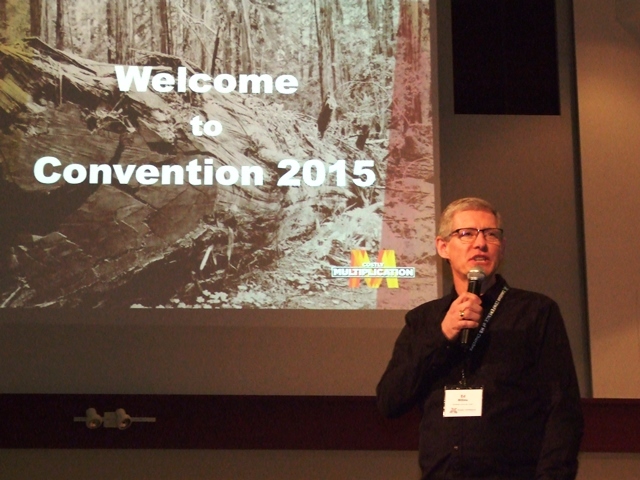 Updated Feb. 27, 2015: convention year corrected and photos added. Updated Mar. 11, 2015: Eden news added.